Background and objectives Excessive correction of chronic and profound hyponatremia may result in central pontine myelinolysis and cause permanent brain damage. In the case of foreseeable or established hyponatremia overcorrection, slowing down the correction rate of sodium plasma levels (PNa) or reinducing mild hyponatremia may prevent this neurologic complication. Design, setting, participants, & measurements This retrospective and observational study was performed with 20 consecutive patients admitted to two intensive care units for severe hyponatremia, defined by PNa <120 mmol/L and/or neurologic complications ascribable to hyponatremia and subsequently treated by desmopressin acetate (DDAVP) during correction of hyponatremia when the rate of correction was overtly or predictably excessive. The primary endpoint was the effectiveness of DDAVP on PNa control. Results DDAVP dramatically decreased the rate of PNa correction (median 0.81 mmol/L per hour [interquartile range, 0.46, 1.48] versus −0.02 mmol/L per hour [−0.16, 0.22] before and after DDAVP, respectively; P<0.001) along with a concurrent decrease in urine output (650 ml/h [214, 1200] versus 93.5 ml/h [43, 143]; P=0.003), and a rise in urine osmolarity (86 mmol/L [66, 180] versus 209 mmol/L [149, 318]; P=0.002). The maximal magnitude of PNa variations was also markedly reduced after DDAVP administration (11.5 mmol/L [8.25, 14.5] versus 5 mmol/L [4, 6.75]; P<0.001). No patient developed seizures after DDAVP or after subsequent relowering of PNa that occurred in 11 patients. Conclusions Desmopressin acetate is effective in curbing the rise of PNa in patients admitted in the intensive care unit for severe hyponatremia, when the initial rate of correction is excessive. Profound hyponatremia presents clinicians with a conundrum (1). On one hand, failure to aggressively treat severe symptomatic hyponatremia in the early stages of the patient’s management can lead to life-threatening consequences, including coma, seizures, and brain herniation (2). On the other hand, an inadvertent and overly rapid correction of such hyponatremia may result in subsequent osmotic demyelination causing central pontine myelinosis (CPM), a dreaded neurologic complication (3–5). Therefore, recommendations advocate a controlled correction of hyponatremia and plasma sodium (PNa) increase not to exceed 10–12 mmol/L (although a rapid 3–4 mmol/L initial increase is desirable in patients with severe neurologic symptoms) within the first 24 hours and 18 mmol/L in 48 hours (6–8). In addition, prompt recognition of the underlying pathogenic mechanism causing hyponatremia is crucial (9). Indeed, spontaneous overly rapid correction is an especially frequent scenario in the setting of hypovolemia (once normovolemia has been restored), primary polydipsia (after implementing water restriction), or impaired dilution due to thiazide diuretics or antipsychotic drugs (after discontinuation of the culprit drug) (10). More problematic is the therapeutic strategy in the face of impending overcorrection or once the target PNa considered safe has been overstepped. Experimental studies have shown an interest in relowering PNa through infusion of hypotonic fluids as one option to prevent osmotic demyelination (11,12). Investigators recently advocated desmopressin acetate (DDAVP) as another modality to reach this goal (10,13). DDAVP, a V2-vasopressin analog, promotes water reabsorption through V2 receptor activation on the collecting duct, thereby reducing urinary water losses that serve to increase the PNa. To our knowledge, only a few case reports (14–16) and two retrospective studies (17,18) not conducted in an intensive care unit (ICU), have provided support for this therapeutic approach. This paucity of data is astonishing because hyponatremia is among the most common electrolyte disorders among patients in the ICU (8,19) and its management is a much debated issue. Because we have used DDAVP for many years as a means to avoid overcorrection of hyponatremia, we report herein the clinical and biologic outcomes of 20 patients admitted in two academic ICUs for severe hyponatremia and subsequently treated with DDAVP because of spontaneous overcorrection, either overt or predictable. This was a retrospective study in which case detection was conducted through a survey in two French academic ICUs (Louis Mourier Hospital and Henri Mondor Hospital). Patient eligibility for study inclusion included admission for hyponatremia with a plasma concentration <120 mmol/L and hyponatremia as a primary diagnosis during the period from January 2008 to December 2011 (n=93). The prescription charts were then reviewed and only patients who were given DDAVP as part of the strategy to control the rise of PNa levels were selected (n=25). We excluded patients for whom critical data regarding modality of DDAVP administration were lacking (n=5). This study was approved by the ethics committee of the French Intensive Care Society (registration number: CE SRLF 12-383). In keeping with expert recommendations, preassigned goals for patients to meet consisted of a maximal increase of PNa of 12 mmol/L and 18 mmol/L within the first 24 hours and 48 hours of the first recorded PNa level, respectively (6,8). Medical records were reviewed and data were collected using a standardized collection form. Data retrieved included the following: demographic features, cause(s), and risk factors for hyponatremia; Simplified Acute Physiology Score II; length of ICU stay; presence, type, and severity of organ failure(s); and death before hospital discharge. Neurologic manifestations ascribable to hyponatremia during prehospital management or within 24 hours after ICU admission were appraised (see the Supplemental Appendix for details). We collected and analyzed urine output as well as the following biologic variables before admission in our two units and every 2–4 hours after admission in our units, 2–6 hours after DDAVP administration, and then on a daily basis once the patients had reached a PNa level deemed safe. The biologic variables consisted of serum and urine creatinine, BUN, PNa, serum and urine potassium levels, and calculated urine osmolarity (see the Supplemental Appendix for details). The first PNa recorded at the time point Ti upon hospital admission was termed PNai. The last recorded PNa before the first DDAVP administration and the minimum PNa level recorded after the first DDAVP administration were termed PNabef and PNanadir, respectively. Details regarding fluid management, including restriction of oral fluid intake, prescription of intravenous hypertonic sodium chloride (NaCl 3%), or loop diuretics, were also reviewed. We also noted the volume and timing of fluids infused, with respect to DDAVP administration, and whether they consisted of hypotonic fluids (sodium concentration inferior to PNa) or electrolyte-free fluids (D5W or D2.5W). We examined the DDAVP dosage, timing of administration, number of administrations, and total dose for each patient. DDAVP was injected intravenously in all but one patient, who received it through the intranasal route. Indication for DDAVP treatment, dosage, and administration periodicity were at the discretion of the attending physician, under the supervision of two authors (D.D. for Louis Mourier Hospital and F.S. for Henri Mondor Hospital). The kinetics of PNa was analyzed before and after the start of DDAVP treatment, using different methods (see Supplemental Figure 1 for details). First, the PNa correction rate before DDAVP administration was determined as the difference between PNabef and PNai, with respect to the time elapsed during this period. The PNa correction rate after DDAVP administration was determined as the difference between the PNa level recorded 24 hours after administration, or before a repeat administration (if it occurred <24 hours after the first injection), and the PNa level evaluated within 2–6 hours after DDAVP administration (in order to take the delayed effect of DDAVP into account), with respect to the time elapsed during this period. Second, the maximal magnitude of PNa variations was calculated as the difference between the lowest and the highest PNa levels recorded before (ΔPNa pre-DDAVP) and after (ΔPNa post-DDAVP) the first DDAVP administration. 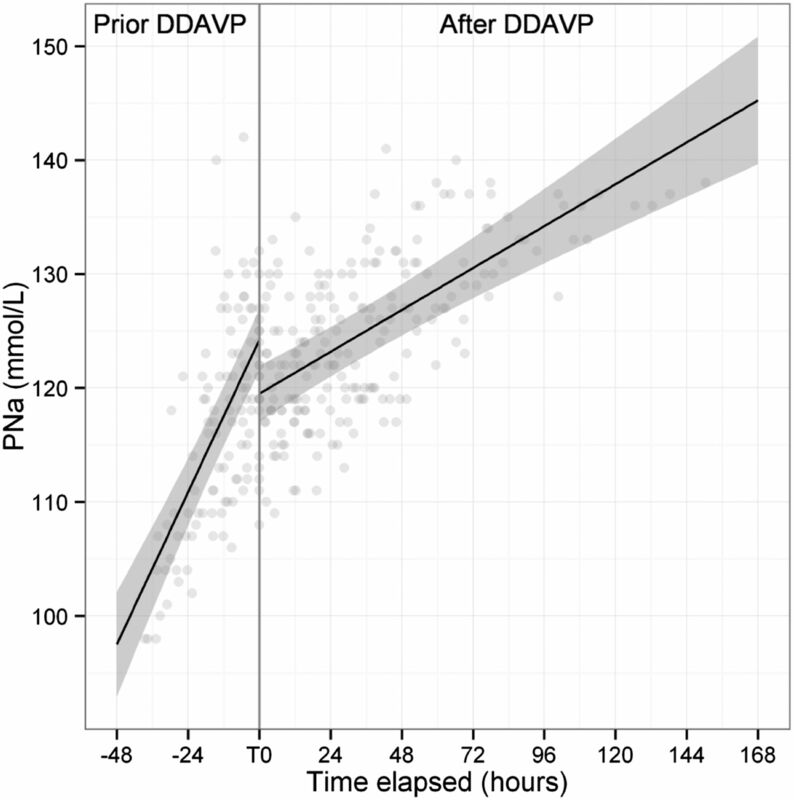 The time interval for ΔPNa post-DDAVP calculation was restricted to 24 hours after the first DDAVP administration. Third, the 24- and 48-hour increases of PNa (termed Δ24 and Δ48, respectively) were defined as the difference between the PNa levels assessed at 24 hours and 48 hours after PNai was recorded. Fourth, the kinetics of PNa levels was also assessed by a linear mixed-effects model described in the Supplemental Appendix. Finally, PNa relowering was defined for each patient as either a Δ48 lower than Δ24 or a negative PNa correction rate after the first DDAVP injection. The primary endpoint was the effectiveness of DDAVP on PNa control, as determined by the time course of PNa levels. In addition, seizure occurrence and the relowering rate after DDAVP injection were investigated. Statistical comparisons were made using the paired-sample Wilcoxon test. Statistical analysis was performed using GraphPad Prism software (version 5.0; GraphPad Software, Inc., La Jolla, CA) and the lme4 package (20). Data are reported as the median and interquartile range (IQR) (25th, 75th percentile), proportions, or estimates (± confidence interval) as appropriate and unless indicated otherwise. P<0.05 was considered significant. Of 93 patients admitted in both units as a result of severe hyponatremia, 20 were included in this study. The cohort of patients given DDAVP comprised 9 men and 11 women with a median age of 57 years (IQR, 51, 74.8). Only three patients were free of any neurologic impairment due to hyponatremia on admission. Preexisting neuropsychiatric disorders affected nine patients, with psychosis in seven patients, severe depression in one patient, and postanoxic motor deficiency in one patient. The median lowest PNa recorded during the study period was 109 mmol/L (IQR, 107, 116.8). For all patients, the lowest PNa level coincided with PNai. Causative factors for hyponatremia and clinical and biologic data on admission are depicted in Table 1. Urine osmolarity and output were readily available in 14 and 11 patients, respectively. Three patients received hypertonic saline infusion (NaCl 3%) owing to the prior occurrence of seizures in two patients and profound hyponatremia in another patient (98 mmol/L). In addition, two patients were given loop diuretics because of concurrent fluid overload in one patient and as an adjuvant measure to raise PNa in another. An oral fluid restriction protocol was implemented for every patient. The median infusion rates of hypotonic and electrolyte-free fluids were 83 ml/h (IQR, 33, 131) and 65 ml/h (33, 117.5) before DDAVP compared with 21.5 ml/h (10.5, 81) and 16.5 ml/h (8, 78.5) after DDAVP (P=0.01 and P=0.01, respectively). The median time elapsed between PNai and the first administration of DDAVP was 13 hours (IQR, 5.3, 23) and exceeded 24 hours in four instances. Repeated administration of DDAVP was deemed necessary in 12 of 20 patients. The median latency between two DDAVP administrations was 25.5 hours (IQR, 19.3, 51). The unit dosage ranged between 2 and 4 µg per administration. Up to four administrations were given in one patient and the median dose of DDAVP per patient amounted to 7 µg (IQR, 2, 8). All patients received DDAVP intravenously. One patient received an additional single 10-µg dose via an intranasal spray. The median Δ24 and Δ48 amounted to 10 mmol/L (IQR, 8, 12) and 11.5 mmol/L (IQR, 7, 16), respectively. The 24-hour upper limit of 12 mmol/L was overstepped in four patients, whereas all patients displayed plasma sodium increases within the 48-hour target limit of 18 mmol/L. Among the four patients whose PNa level exceeded the preset 24-hour limit, two received their first DDAVP dose at a late stage, >23 hours after PNai. Before DDAVP administration, the median urine output and PNa correction rate were 650 ml/h (IQR, 214, 1200) and 0.81 mmol/L per hour (IQR, 0.46, 1.48), respectively. During the 24 hours after the first DDAVP administration, the urine output decreased significantly to 93.5 ml/h (IQR, 43, 143) (P=0.003), whereas the PNa correction rate was close to nil at −0.02 mmol/L per hour (IQR, −0.16, 0.22) (P<0.001 compared with the pretherapeutic rate) (Figure 1, A and C). At the same time, urine osmolarity levels rose from 86 mmol/L (IQR, 66, 180) to 209 mmol/L (IQR, 149, 318) (P=0.002) (Figure 1B). In addition, the PNa correction rate was estimated with a linear mixed-effects model. Accordingly, the mean slope of PNa correction was significantly decreased after DDAVP (0.15±0.04 mmol/L per hour versus 0.58±0.12 mmol/L per hour before; P<0.001) (Figure 2). As a result, the maximal magnitude of PNa variation after DDAVP assessed by the median ΔPNa post-DDAVP (5 mmol/L; IQR, 4, 6.75) was lower than the maximal magnitude of PNa variation before DDAVP assessed by the median ΔPNa pre-DDAVP (11.5 mmol/L; IQR, 8.25, 14.5; P<0.001) (Tables 1 and 2). Effects of DDAVP administration on PNa kinetics and urine composition and output. (A) PNa correction rate before and after DDVAP administration (n=20). (B) Urine osmolarity before and after DDVAP administration (n=14). (C) Urine output before and after DDVAP (n=11). The box plots indicate median, interquartile ranges (25th and 75th percentiles), and minimum and maximum values. Details regarding the methodology of PNa kinetics and urine osmolarity calculation are provided in the Supplemental Material. DDAVP, desmopressin arginine vasopressin; PNa, plasma sodium concentration. Rates of plasma sodium concentration increase before and after DDAVP administration. The slope of PNa was significantly reduced from 0.58±0.12 mmol/L per hour to 0.15±0.043 mmol/L per hour (P<0.001) after DDAVP administration. Details regarding the methodology of the calculation of the slope of the PNa, as determined by the mixed-effect linear model, are given in the Supplemental Material. No cases of seizures were recorded after admission in our institution or after DDAVP administration, despite a significant decrease in PNa (5.1±2.6 mmol/L; P<0.001) (Figure 2). PNa relowering occurred in 11 patients. It was purposely sought for in eight cases because the 24-hour PNa mark had been overstepped (Tables 1 and 2, patients 14, 15, and 17) or was very close to being so (patients 4, 5, 16, 18, and 19), whereas PNa stabilization was the preset goal but in fact this translated in a PNa decrease in the remaining three patients (patients 3, 7, and 13). Details regarding the magnitude, timing, and duration of relowering are presented in Table 3. Only one death was recorded as a consequence of intercurrent rupture of mitral valve chordae and was not connected to hyponatremia. Upon hospital discharge or on follow-up assessment, 17 patients had either a normal neurologic examination or regained their baseline status. Two patients were lost to follow-up. One patient developed mild symptoms suggestive of CPM which were confirmed on brain magnetic resonance imaging. Relevant details regarding this patient (identified as patient 8) are given in Tables 1 and 2. Herein, our experience using DDAVP as a means to curtail PNa overcorrection in patients admitted for severe hyponatremia provides evidence for its usefulness in this setting for the following reasons. First, it was effective, which means that DDAVP almost stopped the excessive rise of PNa. Second, DDAVP did not induce PNa fluctuations of excessive magnitude. In fact, quite oppositely, it tended to mitigate the variations of PNa in this context. As a matter of fact, the lowering of PNa was never excessive and no patient experienced seizures during treatment. Compared with the only two series of DDAVP administration during the correction of hyponatremia (17,18), ours was conducted in the ICU and provides crucial data regarding urine output and osmolarity variations subsequent to DDAVP administration, and analyzes precisely the effects of DDAVP on the PNa correction rate. Indeed, the significant fall in urine output and concurrent rise in urine osmolarity, observed shortly after DDAVP administration, strongly suggest that the observed effect on PNa is ascribable to this treatment, even more so because only mild to moderate volumes of hypotonic fluids were infused. Finally, we also achieved a more stringent control of PNa variations at 48 hours. Strikingly, one single patient, whose hyponatremia was ascribable to carbamazepine therapy and potomania, developed CPM although the rise of PNa was apparently controlled and within predefined limits. His PNa increased 10 and 16 mmol/L during the first 24 hours and 48 hours, respectively. His PNa correction rate never exceeded 0.73 mmol/L per hour and he did not present an increase of >11 and 16 mmol/L during any given 24- or 48-hour period, respectively (Supplemental Figure 3). On the basis of a close analysis of existing data, PNa variation thresholds were recently revised and the 24- and 48-hour limits of 12 and 18 mmol/L may be too “liberal” (8). Accordingly, a case of CPM has been substantiated with an increase of PNa as little as 10 mmol/L (21), a result that is comparable with our case. An even smaller rise of PNa (6 mmol/L during the first 24 hours) could represent a reasonable goal, provided that the patient’s neurologic condition has sufficiently improved (22). Indeed, the increase of PNa per se is far from being the sole determinant of CPM and other factors such as malnutrition, liver disease, alcohol abuse, and hypokalemia increase the risk of osmotic demyelination (8,9,23–25). The patient consistently had a past history of alcoholism and his plasma potassium level was 2.9 mmol/L upon admission. Therefore, setting PNa goals in the context of severe hyponatremia is by no means a “one size fits all” situation and should be tailored depending on individual risk factors (26). Timing is an essential aspect of management of patients with profound hyponatremia, especially when contemplating DDAVP therapy. In this study, four patients exceeded the upper limit for PNa increase (12 mmol/L), two of which were prescribed DDAVP >23 hours after hyponatremia was first substantiated. All of these patients were referred late to our institution. In addition, 12 patients required multiple administrations of DDAVP and 1 patient required up to four administrations. The median time interval was close to 24 hours, but the latency between two injections varied considerably from one patient to another. This calls for several remarks. First, the reemergence of a water diuresis phenomenon, as the effects of DDAVP gradually wore off, was the prime reason for repeated administrations. Second, there is a dearth of data regarding the pharmacokinetics of DDAVP in this specific setting. Twice-daily subcutaneous injections have been advocated in patients with central diabetes insipidus, but whether this regimen is applicable to adult patients in intensive care remains to be proven. Third, patients may not uniformly respond to DDAVP (27). A note of caution is warranted. When combining hypotonic fluids and DDAVP, a swift and sometimes unexpected drop in PNa may be observed when large volumes of hypotonic fluids are administered. In line with this notion, a significant decrease of 5.1±2.6 mmol/L was noted after the first DDAVP administration and PNa relowering was observed in 11 patients. However, none of the patients suffered seizures as a consequence of the acute decrease in PNa; in eight patients, a significant reduction in PNa was deliberately sought because of patent (or impending) overcorrection, in the hope of preventing osmotic demyelination. In the three remaining patients, PNa stabilization was the predefined aim and PNa relowering was accidental, albeit of mild magnitude. Moreover, DDAVP therapy may offset the need for infusion of large volumes of fluids, thereby relieving caregivers of a cumbersome and sometimes inefficient task. In fact, the volume of electrolyte-free and hypotonic fluids administered after DDAVP was significantly reduced. There are several limitations to this study, inherent to its retrospective nature and small sample size. Importantly, our study was not designed to address the intricate problems of CPM. In addition, the lack of control patients further hampers the generalization of these results. This study was based on chart review. Thus, urine output and osmolarity values were missing in a few patients and there was some variability in the timing of urine and plasma collection for the determination of urine osmolarity and PNa. In addition, DDAVP dosage and administration interval were neither predefined nor standardized. Treatment of profound and symptomatic hyponatremia remains a daunting challenge (1). Our study shows that DDAVP is effective in curbing the increase in PNa in patients admitted to the ICU for severe hyponatremia. Until more is known about DDAVP pharmacokinetics, DDAVP dosing schedules and dosages may be adjusted according to the course of urine output, PNa, and urine osmolarity, as long as a scrupulous monitoring and repeat sampling are undertaken. Finally, the results shown herein, together with previous evidence (17,18), require a multicenter randomized trial to ascertain the usefulness of DDAVP with respect to PNa control and whether this will translate into a diminished risk of CPM. This article contains supplemental material online at http://cjasn.asnjournals.org/lookup/suppl/doi:10.2215/CJN.00950113/-/DCSupplemental.